Great. Now, as I’ve mentioned before, there are lots and lots of food cognates in Russian. And one of the most popular in recent years is clearly sushi. I see sushi restaurants everywhere, now, in Russia and Ukraine. So, try saying: I want sushi. 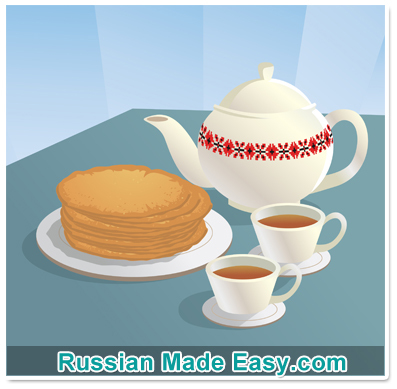 Ask your friend: Want blini? So, what is чай? Well, when you pour boiling water over the dried leaves of the tea plant, the resulting drink is called чай. Do you hear how the word “чай” is hidden in the word “Chi-na”? No, thanks. I want coffee. Нет, спасибо. Я хочу кофе. Say: I want tea and pancakes. Я хочу чай и блины. He asks: What is there? There is soup and there is salad. Есть суп и есть салат. He says: Ok, I’ll have the soup. Do you know what a verb conjugation is? I know, “conjugation” is one of those fancy grammar terms I usually hate, but it’s good to know, at least for today’s tip. So, in English we say: I want…You want…They want….but Steve…wants. Or….I go, you go, we go, but she….goes. Why is it “you go” but “she goes”? Because, in English, there’s a different conjugation for he and she. To a friend: You want-ayesh? The “I” form, as in: I want tea. So, where’s the “tip” in all of this? Well, the absolute worst thing you can do is try to learn all six conjugations at once. And yet, just this morning, I got an email from a frustrated student who is also taking private Russian lessons from a native speaker. The woman is not only making him learn all six conjugations right from the start, she’s chiding him for not having them down…for not having mastered them. That really frustrates me because, yes, native speakers are experts, of course, at speaking Russian. But that does NOT in any way make them experts at teaching it. The fact is, conjugations should be learned gradually. One at a time. Do it that way and they’re no sweat at all. Нет, спасибо. Я не хочу кушать. Did you hear “nyeh” or “nee”? Я не хочу кушать? I don’t want pizza. I want sushi. Я не хочу пиццу. Я хочу суши. No thanks. I want coffee. No thanks. I want yogurt. Нет, спасибо. Я хочу йогурт. No thanks. I don’t want to eat. No, I don’t want pasta. I want soup. Нет, я не хочу пасту. Я хочу суп. Ты не хочешь пасту, ты не хочешь пиццу, ты не хочешь блины….ты только хочешь суп! There was a new word in there, did you catch it? только Could you guess the meaning based on what she was saying? To check, please visit RussianMadeEasy.com. You’ll find the answer the transcript of this podcast. Meanwhile, in the next episode we’re going to have you play the role of interpreter. It’s great practice and you’ll be amazed at how much you’ve learned and can understand. See you then! ..as in: You don’t want pasta, you don’t want pizza, you don’t want pancakes…you only want soup! Greetings. I am enjoying your work. I am sure it took a tremendous effort to create this work and am writing in a spirit of support with the intention of being helpful. and i instinctively look at the Russian words which further distract me from what i heard. I hear myself constantly saying “what” and then another “what”. The articulation is not connecting for me. I wonder if English pronunciation text would be helpful. It could be a smaller font or a different color. Just something to grab on to so that there is some comprehension. I understand that might be impossible because you are working with many different factors of which i have no knowledge but i wanted to share and wish you well and say thank you. We do just that, in fact, in our video based course, Russian Accelerator. Hello! I’m having some trouble with the word кушать, apparently it’s old fashioned and Russians use есть. And instead of saying Я голоден they say Я хочу есть, so I’m hungry is less common than I want to eat? Thanks in advance, I’m enjoying these podcasts, you make Russian so easy! Whereas есть is used for the things one wats in general. Hey Mark, i want to say thank you, this is a great website and i can see all the effort you put on this to help people, that speaks well of you. I’m actaully a non native english speaker as you might notice. It’s so cool i have the chance to listen to english and some russian simultaniously. Thanks again. So glad you’re enjoying the podcasts (in both languages!) And please, feel free to share the site with other students o Russian. 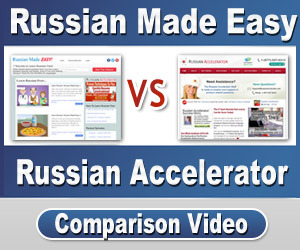 Maybe we’ll see you in my Russian Accelerator course this year! Hey Mark, these podcasts have been great. It’s helped me not only with my Russian, but with my polish and Ukrainian as well. I’ve considered myself a memory expert for years, being able to pick up vocabulary at rapid rates, but I’ve picked up a few tips here that I can apply to my other languages. этот курс действительно помогает мне, спасибо! I’ve been using your podcast to learn Russian and so far I love it very much. I have taught myself several languages but Russian has been such a challenge. I see you are a very good teacher with a lot of experience and I have also benefited from your teaching skills because I myself am a teacher too. Mark, my brain is so used to learn languages that I think your podcast (althought it’s great and I love it) is maybe too easy for me. Have you got any ideas to help me learn Russian faster? Thanks for the feedback, Alon. The app is indeed due for an upgrade and we will be trying to incorporate all of those new functions.